Heat oven to 350°F (325°F for dark or nonstick pans). Make, bake and cool cake as directed on box for two 8-inch or 9-inch round pans--except use 1 1/4 cups of orange juice mixture in place of the water and add 1 1/2 teaspoons orange peel along with egg whites. Chill completely cooled layers 45 minutes before cutting. Cut each cake layer horizontally in half to make 2 layers. Fill layers with generous 1/2 cup pie filling. Frost side and top of cake with frosting. Garnish with orange peel. Refrigerate about 1 hour or until chilled. Store loosely covered in refrigerator. To split cake rounds evenly, mark side of cake with toothpicks and cut with a long, thin knife. Garnish with strips of lemon and orange peel curled together, or for a last-minute garnish, use small wedges of lemon and orange. 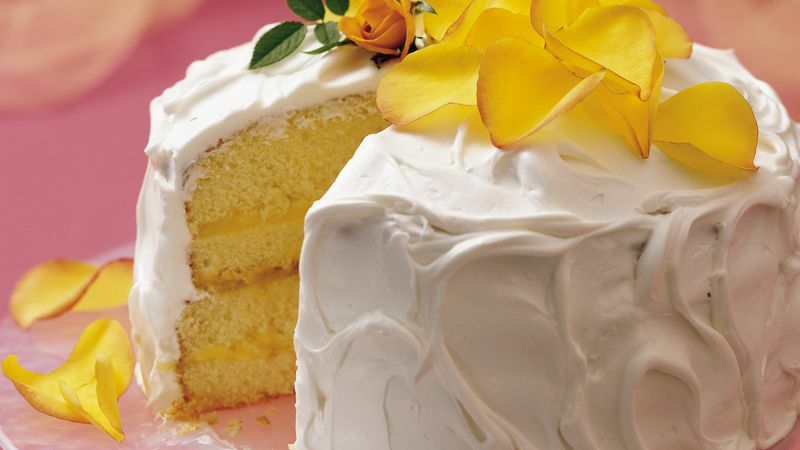 Add a fragrant mound of yellow and orange rose petals to the top of the cake for an elegant extra-special cake.